Keeping livestock demands 24/7 attention, even during the Christmas holiday season. The Christmas-to-New-Year holiday period is a great time for catching up with friends and family and for spending quality time in their company. There is generally lots of feasting and merry-making to be done, which is often accompanied by generous amounts of snoozing in an armchair in front of the TV. For some people, however, the daily pattern of work is not interrupted, even by the festive season. Here I particularly think about my commoning friends, who, like other farmers, smallholders, shepherds and husbandmen, will be tending to their herds, flocks, packs, teams and colonies – according to the type of animal they keep – in much the same way as they do every day, but perhaps in the hope of some well-earned time off once the important chores are done. Some of the jobs around the farm, smallholding or estate cannot be mechanised and still rely upon the physical labour and observant eye of those tending to animals and crops, in much the same way as farmers of old would have done. A few years ago I wrote an article about a calf, named Mary Christmas, whose story was somewhat exceptional. She was born, and orphaned, in dramatic circumstances on 25th December, hence her name. However, her entrance into the world demonstrated the level of cooperation that exists between the Forest folk, even on day that is supposed to be one of quiet ease. Due to the sacrifice of those who gave up precious time with their families to help care for her, she continues to thrive. Only recently I saw her in a field with several calves performing her duties as matriarch. She is a big sturdy animal with the sweetest temperament and is easily identified, being the only brown cow among an otherwise black herd of Aberdeen Angus cattle. In the spring when they all go out onto the Open Forest, she will assume the role of teacher to yet another generation of free-roaming cattle and show them all the best places to drink, eat, sleep and chew the cud. Her story, which has been read and appreciated by a worldwide audience, remains one of the most popular articles I’ve ever written. I often wonder if the reason for her popularity is that the story of Mary Christmas, as well as being a heart-warming tale of survival, also demonstrates the real community spirit that is part and parcel of the practice of commoning. For those who live an urban existence perhaps there is no mutual thread to hold their neighbourhoods together, which creates a fascination with, and even nostalgia for, the ‘old ways’ that still exist in the New Forest and many rural parts of the country and, indeed, the world. The support structures and camaraderie that exist between those who nurture the environment, wildlife and livestock are but some of the many compensations for a life lived in all weathers and at all hours. No matter how sophisticated we become as a species, no matter how technologically advanced we are, with all the social media communications, labour-saving gadgets and mechanical paraphernalia of the modern world, deep down inside there is always an essential yearning to belong to the natural world and a close-knit community. In historical terms, it wasn’t until fairly recently that we moved from the country into the towns and lost our connectivity with the life cycle, pattern of the seasons, food production and, perhaps, even with each other. For me, the wonder one feels when viewing the inestimable stars on a cloudless night; the quiet contemplation that is induced by the sound of a babbling brook in the forest; and, the skin-tingling, hair-raising excitement of hearing the sound of many galloping hooves, is part of an intrinsic need to experience a point of reference to the natural world that gives ones life meaning. Being part of the commoning community amplifies this sense and shines a light on a way of life that, once upon a time, would have been familiar to all. 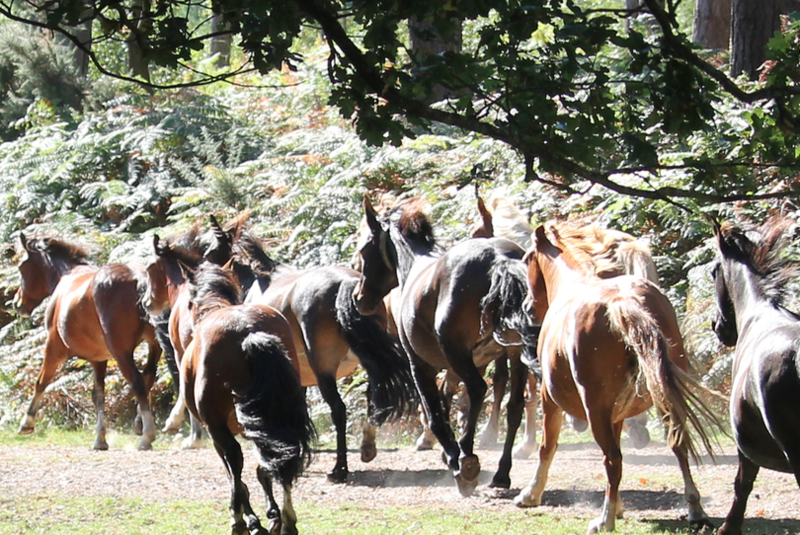 The sound of galloping hooves is guaranteed to get the heart pumping. 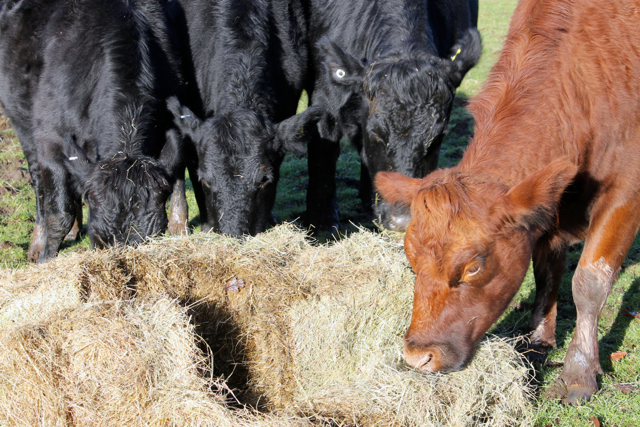 This entry was posted in New Forest and tagged Aberdeen Angus, Calf, cattle, Christmas, co-operation, commoning, community, Cow, cows, environment, farming, free-roaming, herd, Mary Christmas, matriarch, nature, New forest, New Year, rural, seasons, smallholding, urban, wildlife. Bookmark the permalink.